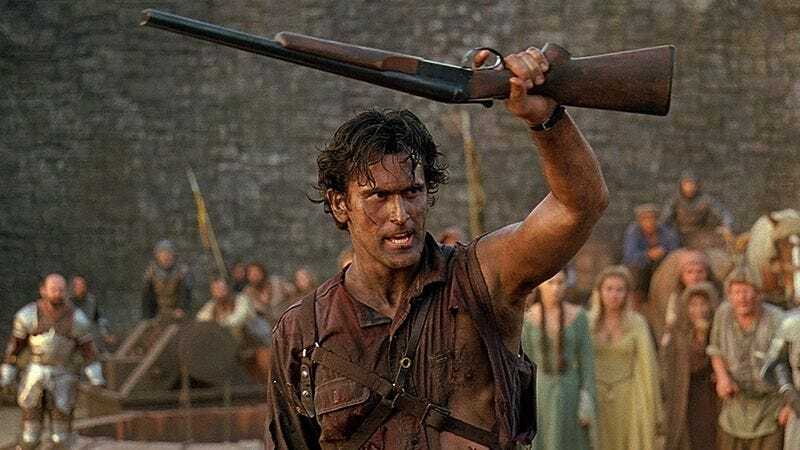 Good news, you primitive screwheads: Ash Williams, the cocky, moronic, and ultimately badass hero of Sam Raimi’s Evil Dead films will be coming to TV screens next year. The previously rumored Evil Dead TV show—now officially titled Ash Vs. Evil Dead—will be airing on Starz, with Raimi directing the pilot and Bruce Campbell returning as horror’s favorite grizzled, chainsaw-handed S-Mart employee. The show, executive produced by Campbell, Raimi, and original Evil Dead producer Rob Tapert, will once again pit a now-middle-aged Ash against the hordes of gore-filled, nastily cackling monsters known as the Deadites, as an undead-inflicting plague is unleashed upon the world. The show is currently set to run for 10 half-hour episodes of blood, slapstick comedy, and expertly growled one-liners. Starz previously worked with Raimi and Tapert for the equally bloody, but slightly less cartoonish Spartacus, which the pair executive produced.